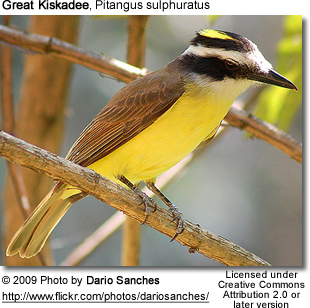 The Great Kiskadee, Pitangus sulphuratus, is a passerine bird. 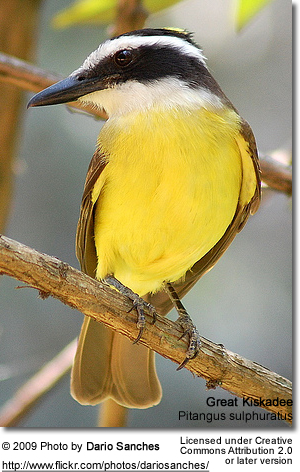 It is a large tyrant flycatcher, the only member of the genus Pitangus. It breeds in open woodland with some tall trees, including cultivation and around human habitation, from southern Texas and Mexico south to central Argentina, and on Trinidad. It was introduced to Bermuda in 1957, and to Tobago in about 1970. 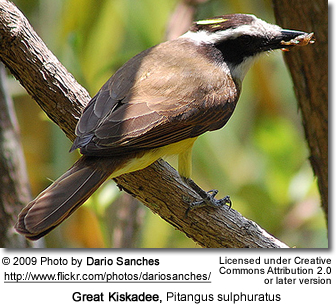 Adult Great Kiskadees are 22cm long and weigh 63g. The head is black with a strong white eyestripe and a concealed yellow crown stripe. The upperparts are brown, and the wings and tail are brown with usually strong rufous fringes. The black bill is short and thick. 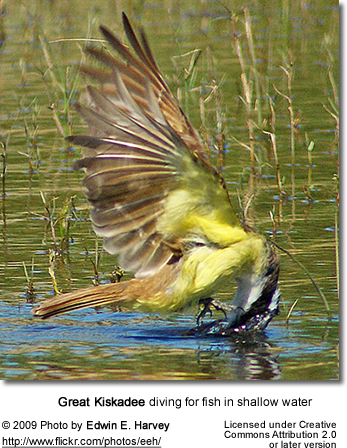 The similar Boat-billed Flycatcher has a massive black bill, an olive-brown back and very little rufous in the tail and wings. 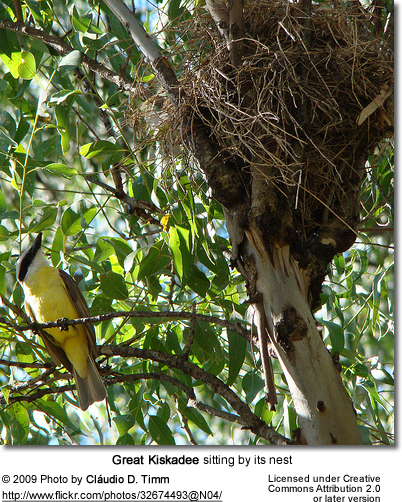 The Great Kiskadee is a common, noisy and conspicuous bird. It is aggressive, and will drive away larger birds entering its territory. It is almost omnivorous, and hunts like a shrike or flycatcher, waiting on an open perch high in a tree to sally out to catch insects in flight, or descending on rodents, or other small prey. It will also take some fruit and occasionally dives for fish in shallow water (making it one of the few fish-eating passerines). 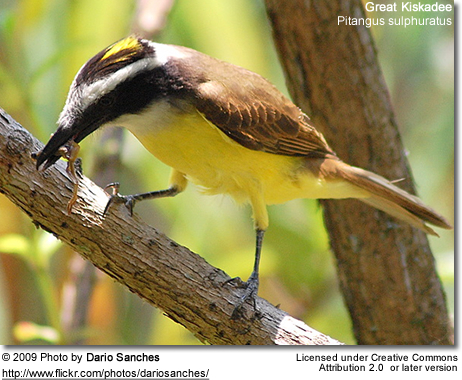 Such opportunistic feeding behavior makes it one of the commonest birds in urban areas around Latin America; its flashy belly and its shrill call make it one of the most conspicuous. The call is an exuberant BEE-tee-WEE, and gives the bird its name in different languages and countries. In Brazil (Portuguese) it is bem-te-vi, that is, "I've spotted you!". In Spanish countries it is often "bien-te-veo", with a similar meaning, as in a Mexican name, luis bienteveo. In French it is tyran quiquivi. 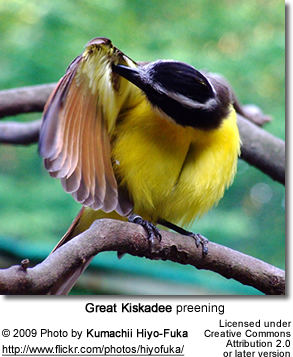 Not being appreciated as a song bird, the Great Kiskadee is not usually kept caged and therefore has escaped the depredations of poaching for the pet trade. Also, its feeding mostly on live prey makes it extremely difficult to keep in captivity.